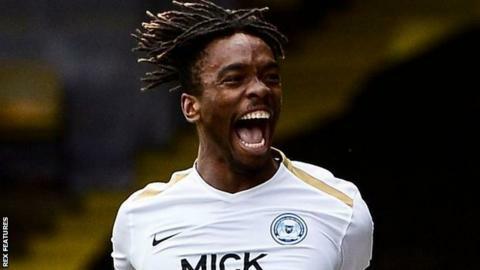 Ivan Toney's late goal earned unbeaten League One leaders Peterborough United a thrilling win at Southend United. Matt Godden fired in the opener for Posh, who have made the best start to a season in the club's history under Steve Evans. Godden stabbed in again after the hosts failed to clear Marcus Maddison's free-kick, but Tom Hopper gave Southend hope when he tapped in from Harry Bunn's pass. Stephen McLaughlin's strike drew Southend level, before Toney slotted in to earn his side all three points. Match ends, Southend United 2, Peterborough United 3. Second Half ends, Southend United 2, Peterborough United 3. Attempt missed. Timothee Dieng (Southend United) header from the centre of the box misses to the left. Corner, Southend United. Conceded by Joe Ward. Attempt missed. Timothee Dieng (Southend United) header from the centre of the box misses to the right. Corner, Southend United. Conceded by Jason Naismith. Substitution, Southend United. Shawn McCoulsky replaces Stephen McLaughlin. Goal! Southend United 2, Peterborough United 3. Ivan Toney (Peterborough United) right footed shot from very close range to the centre of the goal. Attempt missed. Ivan Toney (Peterborough United) right footed shot from outside the box is high and wide to the right from a direct free kick. Corner, Peterborough United. Conceded by Elvis Bwomono. Attempt blocked. Marcus Maddison (Peterborough United) left footed shot from the left side of the box is blocked. Substitution, Southend United. Theo Robinson replaces Simon Cox. Substitution, Peterborough United. Joe Ward replaces Siriki Dembélé. Corner, Peterborough United. Conceded by Michael Turner. Goal! Southend United 2, Peterborough United 2. Stephen McLaughlin (Southend United) left footed shot from the centre of the box to the bottom left corner. Assisted by Ben Coker. Attempt saved. Tom Hopper (Southend United) header from the centre of the box is saved in the top centre of the goal. Corner, Southend United. Conceded by Marcus Maddison. Corner, Southend United. Conceded by Rhys Bennett. Substitution, Peterborough United. Ivan Toney replaces Jason Cummings. Ben Coker (Southend United) wins a free kick on the left wing. Attempt saved. Tom Hopper (Southend United) left footed shot from the left side of the box is saved in the top right corner. Attempt missed. Simon Cox (Southend United) right footed shot from the centre of the box is too high. Simon Cox (Southend United) wins a free kick on the right wing. Goal! Southend United 1, Peterborough United 2. Tom Hopper (Southend United) left footed shot from very close range to the bottom right corner. Assisted by Harry Bunn. Attempt missed. Matt Godden (Peterborough United) right footed shot from the centre of the box misses to the left. Goal! Southend United 0, Peterborough United 2. Matt Godden (Peterborough United) right footed shot from the right side of the six yard box to the top right corner. Assisted by Ryan Tafazolli following a set piece situation.